Corvallis defense attorney Jennifer Nash had been representing a client in a custody battle when the man was indicted last year by a grand jury on sexual abuse charges. Nash was shocked. She knew the police had been investigating the case. But she also knew officers had received a report from the crime lab citing inconclusive evidence of abuse. The attorney wasn’t sure how a grand jury had determined her client should be charged for sexual abuse. So she called Benton County District Attorney John Haroldson. Upon consideration, Haroldson dismissed the charges against Nash’s client. Nash later learned that the assistant prosecutor and detective in the case had presented the crime lab report without explaining the inconclusive evidence to the grand jury. “I’m absolutely convinced that if those proceedings had been recorded, we would have known what the DA was presenting,” Nash said. Nash and other defense attorneys across Oregon were among the proponents of a new law that will require all grand jury proceedings, which are held behind closed doors, to be recorded. If the proceedings result in an indictment, a defendant’s attorney will be able to review the recordings to learn what evidence had been presented and how it had been posited to the grand jury. Proponents argued that the recording will add transparency to the judicial process and provides a check on prosecutorial powers. They say it’ll also help them better decide whether to take a plea agreement or go to trial. District attorneys have vehemently opposed the law. Prosecutors say the cost to record such proceedings will be onerous, while adding extra steps to an already encumbered process and creating more opportunities for litigation. Senate Bill 505 was passed by the state Legislature earlier this month. It is awaiting the governor’s signature. The law requires district attorneys in Oregon counties to create and maintain digital recordings of the seven-person, closed-door sessions used by prosecutors to obtain an indictment against a person accused of a criminal act. The bill requires Deschutes, Jackson and Multnomah counties to begin recording next year, and will require the remaining counties, including Linn and Benton, to begin recording the proceedings in 2019. The change is significant: Such proceedings always have been conducted in secrecy, with only the prosecutor providing evidence and witnesses to the jury, and without the defendant or a defense attorney present. Under the former law, grand jurors were allowed to make handwritten notes during testimony. Defendants did not have an automatic right to the pretrial notes, but they could request access to them and a judge would make a decision. Supporters of the new law say it’ll create a more genuine account of the grand jury testimony. Defense attorneys will be able to access the recordings following the defendant’s arraignment. Grand jury deliberations, during which the jurors make their decision, will not be recorded. Under the law, the prosecutor in a case could ask that parts of the recording be redacted to protect things like the anonymity of a confidential informant. But Marteeny believes that part of the bill is nothing more than a placation. “That’s a window-dressing measure,” he said, suggesting no prosecutor would really be able to show cause to deny access to the testimony. District attorneys say the law will create a more litigious environment as defense attorneys and prosecutors argue over what occurred during the grand jury proceedings and what information in the recordings should be redacted. Haroldson said it’s a defense attorney’s responsibility to scrutinize the prosecution’s case. “And even if we do things properly there may be arguments that they can make to advance their client’s case,” he said. Instead of going through that litigation, Haroldson and Marteeny speculate more felony cases will use preliminary hearings to establish probable cause, rather than grand juries. Preliminary hearings are held before a judge and the defendant and defense attorneys may cross-examine witnesses. Benton County Circuit Court Judge Matthew Donohue declined to say whether he is for or against the new law. But the judge said he worries it will create more labor for the court’s staff, which will have to manage and redact the recordings. Extra litigation could also increase the time it takes for cases to be resolved, he said. “It could be a big slowdown in the ability of the court to move cases through in a timely manner,” Donohue said. The judge said more staff may be needed for the increase in the workload, but he’s concerned the court won’t have the necessary funding. The Legislature appropriated $10 million for the first three counties to establish and implement the recordings. About $2 million is set aside for the recording equipment, while $8 million is going to the state Emergency Board, which can allocate the funds to counties that demonstrate a need. Officials in Linn and Benton counties do not yet know what it will cost them to carry out the new law. Haroldson worries the law will become an unfunded mandate, with the costs falling on local jurisdictions. For defense lawyers, however, any increased cost or change in process will be a small price to pay. Albany attorney Kent Hickam has been a defense lawyer for 37 years. He said recording grand jury testimony will provide a more complete record for a case. If there is a discrepancy between witness testimony during a grand jury and the testimony given at trial, defense lawyers will be aware, he said. Also, because grand juries, unlike trial juries, are allowed to ask questions, the potential for new information to come out is very real. Corvallis attorney Joan Demarest is a defense lawyer who worked for years as a prosecutor. She said more access to recorded testimony is essential to the process. Demarest said anyone accused of a crime has the right to access to all the evidence. But Marteeny argued that all the same evidence is available through police reports and affidavits. That argument is flawed, Demarest said. Demarest also pointed to the fact grand jurors are allowed to ask questions, and that unlike a written police report, the answers to those questions are under oath. Corvallis court-appointed attorney John Rich said the recordings will allow him to more thoroughly evaluate his cases and how to resolve them. Marteeny said prosecutors have a duty to inform the defense of any deviations in witness testimony. The same would be the case for exculpatory evidence, or evidence that could exonerate a defendant. But, Nash said, the prosecutor may not interpret testimony in the same way a defense attorney might. And, without recordings, defense attorneys don’t know that such evidence exists. Rich also said the recordings will provide more transparency in the cases against police when they’re accused of killing someone. 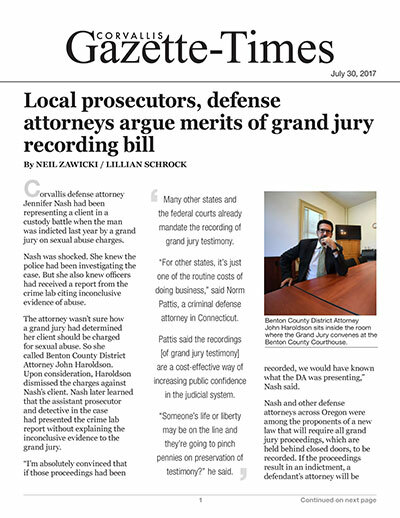 According to the bill, the recordings of grand jury testimony will not be public record, unless the case involves a public servant. “Public servants are held to higher standards,” Marteeny said. If a case against a public servant goes to grand jury and the jurors choose not to indict, the recordings could be released to the public. “That’s almost tailor-made for a police shooting,” Donohue, the judge, said. The NAACP Corvallis area branch lobbied the Legislature in favor of the bill. The organization’s second vice president, Robin de La Mora, said the bill is about transparency in the justice system. She recalled the case of Quanice Hayes. A Multnomah County grand jury found in March no criminal wrongdoing by the Portland police officer who fatally shot Hayes, a 17-year-old, one month earlier. The Multnomah County District Attorney’s Office said it would release the transcripts of witness testimony given before the grand jury. Multnomah County is the only one in Oregon that has routinely recorded grand jury hearings that review officer-involved shootings and made them public if no indictments were made. Marteeny worries that when a private citizen is accused of a crime but not indicted, the recorded grand jury proceeding could come out. Some victims’ rights groups have opposed the law, saying the discretion in grand juries is required to protect not only defendants, but victims. They say the law could violate the victims' privacy and put them in danger of intimidation or harassment by defendants, according to legislative testimony. Donohue isn't convinced by the argument. “Having the grand jury testimony of that individual being disclosed, I don’t think would create any peril to that witness or victim above or beyond what would be created by their testimony at a trial,” the judge sald. Many other states and the federal courts already mandate the recording of grand jury testimony. "For other states, it’s just one of the routine costs of doing business," said Norm Pattis, a criminal defense attorney in Connecticut. Pattis said the recordings are a cost-effective way of increasing public confidence in the judicial system. "Someone’s life or liberty may be on the line and they’re going to pinch pennies on preservation of testimony?" he said. The first three counties to start recording grand jury proceedings are required to submit a report to the Legislature in 2019 outlining how the implementation of the law is going. This may lead to legislative changes in the bill before the statewide implementation, Donohue said.